For nearly five years, my life was all about Etsy. For a few years I ran an Etsy shop – one that I truly loved working on. It was so much fun to find success in sharing my love of handmade goods with my customers. 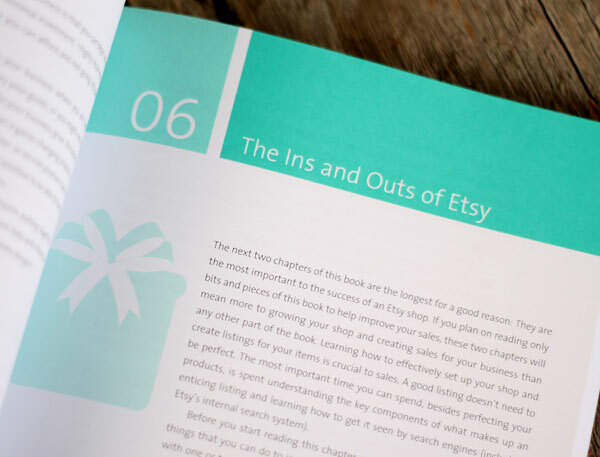 Earlier this year I got the opportunity to write a book on how I found success with my shop and share those tips with others so they could start their own Etsy shop. 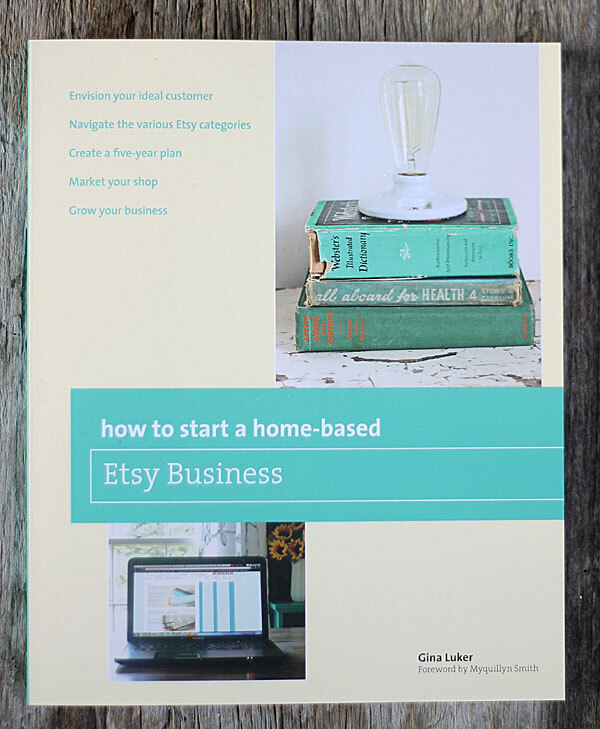 After months of writing, editing and waiting – and now How to Start a Home-based Etsy Business is now available. 1) If your shop is a business, treat it that way. Confidently price your items based on the supplies + time + administrative time it took to source, create, produce, pack & ship the item, along with any customer service time. We’re talking every little thing that went into making it. Not counting packing time is ripping yourself off. Not counting every little supply comes off your bottom line. This isn’t personal – it’s business. If you’re not making money then it’s a hobby. 2) Get schooled on SEO. There are entire books devoted to SEO (search engine optimization) as well as entire websites that talk of nothing else. I give you the foundation of creating a great SEO platform within the book. If you don’t learn how to make the most of your shop, you’re going to get left behind. SEO is crucial to the success of any website. 3) Luck doesn’t just happen – it’s a sign of years of work. Rarely does someone happen upon success without blood, sweat and tears. It seems so magical that I “quit my day job” within a year of starting this blog. But, no one really thinks about the fact that I spent two years working on a blog before this one that failed miserably. Those two years taught me how to learn HTML and use social media. It taught me how to be part of a community. There is knowledge in failure. 4) On Etsy, 100 is a magic number. I don’t know what it is about the magic of 100 listings, but I can tell you that I’ve talked to hundreds of sellers in the last five years and if you’re a full time seller then you most likely have over 100 listings in your shop. Multiple daily sales only happen in shops that are big enough to hold them. You need variety, plus enough room for SEO to work well. Get to 100 listings as fast as you possibly can. 5) Photography IS your product online. In stores, customers can pick up your goods – feel them, smell them, hold them in their hands. Online sales are all done through photographs, so make sure yours are as best as they can possibly be! You don’t need a fancy DSLR camera, even most cell phones these days have the ability to take amazing photos. You just need to take your time, get the lighting right and learn how to represent your products in the best possible way. Those five secrets can change the course of your business. Seriously. If someone in your life runs an Etsy shop or wants to start one – I’d be so honored if you gifted them this book for Christmas. And, I can promise you, it will be a wealth of knowledge for them to use to grow their shops. I’ve done it myself, plus helped hundreds of others grow their shops into blossoming businesses through speaking at conferences and through my personalized Etsy coaching services. Definitely keep for myself. Am interested in this for when I retire. Congratulations on getting published! Thank you for sharing your expertise, I would love this book! I would actually use it for myself and share it with a great friend too! I would keep it! I started a shop on Etsy after doing a little research. But this book would really help me to better understand the business side! I don’t have an Etsy shop right now, for reasons beyond my control but I would like one, one day and I’d love to read this book! I have been considering a shop and this would be a great helping tool – thanks for the chance to win your book. I would keep it. I am very happy with the growth of my Etsy shop….but I really look forward to taking the baby shower favors to the next level this year. I have learned to watch what brings people to my shop and build those things into an ever stronger presence. Can’t wait to read your book! I would keep it for myself and my daughter. We have talked for the past couple of years about starting our own Etsy store. I am ready to retire from my main source of income (self-employed also) and my daughter is in school part time and a single mother. We both have different skill sets but both still need income. Thank you for considering os for the opportunity to win your book. It will be put to good use! I would keep the book for myself! Oh my this is perfect! If I won your book I would keep it and read, study and apply the knowledge I gained from your book. I would then give it to a friend who may have or be interested in opening a successful Etsy shop. I create original, one of a kind Holiday decor from Creative Paperclay. I’ve had an Etsy shop a few years back that failed. popped on an never looked back. I made enough money to continue to help my three during their college years, an spent full time with my parents. It was a life changing for me to be able to be there for the people who needed me. After my parents past away, I didn’t go back to my career, I stayed with Etsy. I know I could learn so much more about the ins an outs of the world of Etsy. Your book looks amazing. I would love to know another seller’s prospective. As my parents said you can learn something everyday. To say I Need this book is a huge understatement! So many people have said that I need to sell my things on Etsy (even the hubby) 🙂 but I’m so completely overwhelmed and nothing has happened. Thank you for sharing your experience and helping us newbies along the way. Keep for myself..my friend and I have dreamed of having an Etsy business. I will buy one and gift one for sure. Congrats on the book!!! I would keep the book for myself and use it to open my own Etsy shop this coming year. I love spending time working in my studio creating things with my hands, but I don’t seem to have the same enthusiasm when it comes to computer tasks. Like many others, I get overwhelmed thinking about it so I keep putting it off. My goal for 2014 is to take the great advice given to me by an old friend — eat the elephant one bite at a time! Wish me luck! My daughter keeps telling me I need to start an etsy shop. The idea is percolating in the back of my mind, and I’m slowly learning about it. Your book sounds wonderful. Your story is an inspiration. Thanks! I would love to win your book for myself, you are an inspiration. I have sales but am missing the SEO part of things. Times have been tough and I really need my shop to be successful. I have good customer service, good variety but something is missing. I have noticed the big sellers only have a few items but many of them, something very unique. Is this important? I don’t want to be a passing fad but to get front page attention you need wild, weird items. I would SO keep it for myself. My frustration level is maxed out. I would totally keep it, and then encourage my other etsy friends to get a copy for themselves! I have been contemplating starting an etsy shop for years but always thought it would be difficult to be seen in the millions of other shops. So I’ve been open for about a month and have had 9 sales so far, which is encouraging! i would definitely be keeping the book for myself! i just opened an etsy shop but have SO many items that still need photographed and listed – the photographs are definitely my down fall….i am struggling with this part a bit but i know i will find my groove! I have been reading your blog and watching and waiting for your book to be out. I would definitely keep it for myself. I just started selling on Etsy in March and I’m hoping to take it to the next level in 2014. I have SO much to learn. https://www.etsy.com/shop/WORDartbyKaren Thanks for the opportunity to win. WHOOT!WHOOT! Congratulations!! What an accomplishment! Yes, owning a business, any business comes with years of blood, sweat, tears, and, lets not forget, sacrifice as well. I would love to win the book and I would definitely read it and learn from it all I can and then pass it along to someone that I know could use the help as well. Enjoy the Blessings of your hard work! It may be the season of giving, but I would give this book to myself. I know that there is a wealth of info to help me grow and polish my store. I would love to win your book, and bless you for offering it. Hope it’s as successful as you’ve been in all else. I would love to start out by reading the book, but would pass it on to others I know who are fledgling Etsy sellers like myself. I started a shop, but have yet to list anything due to family circumstances. But looking forward to starting in 2014! I would keep it for myself until I absorbed all the info and then lone it out to others that would use it. My shop is fairly new and struggling and I definitely could use the help to get it off the ground. I know my artwork is good but it’s still very discouraging to go months without a sale. Congrats on your success! I’d keep it for my own use. I’d keep it for me. I’ve got great ideas, but they need to become realities in 2014!! Would definitely keep for myself. I have a booth in an antique mall and would love to being selling on ETSY. Thank you for this opportunity and may you have a blessed Christmas. I would share it with someone. My friend sews beautiful smocked dresses, but usually gifts them to loved ones. Congratulations on the completion of your book! How exciting. I would use the book and share it with my 17 year old daughter( AND share it with a friend.) We have been wanting to open an Etsy together but we haven’t really known how to get it started and what was realistically needed. Your book sounds very helpful. Thank you so much for the chance to win and for sharing the Five Etsy Secrets. In reading them, I’ve already learned about some things to focus on to get started. I know the info in your book would be just the help we would need to start our own shop and it would be just in time for the new year! Thank you for sharing your knowledge and experience with us all. Hi. I would keep the book and share what i learn with a friend who makes jewelry. Thank you. I don’t just want the book, I NEED THE BOOK. I have struggled with my Etsy shop for over a year now. See my shop at Zog’s Place. OMG a book on Etsy!!! I would definitely keep this! I quit my job to stay home with my new baby and I want so badly to carry out my goal of opening an Etsy shop within 6 months. I want to of it right and treat it like a proper business and your book would be perfect I’m setting the foundation for my store. Fingers crossed! I’m considering a shop! This would be a help to get it going! What a fantastic giveaway! Congratulations on your book. I would love a copy for myself. I quit my regular job to be able to help my dad and step mom. My shop should be ready to open in January. While it is with Storenvy, I think your book would be a great help in succeeding. I would love to win this book! I want 2014 to be the year I take some giant leaps, and this book would be a great source of guidance for me. I would keep it for myself. I just signed up for an Etsy shop and have been meaning to make this a priority in my life (2014 goal!). I would keep it for myself–I just started doing the research on opening a shop on Etsy. My family and friends think I really need to open one up to sell all the things I like to pick! I work from home and this could just add to my current position. I would love to win this book to give to my mom!!! I would love to win this book. I always like to learn new things! If I won this book, I’d give it to my mum, because she’s been wanting to start her business for ages, and just doesn’t know how. I try to give her lots of encouragement, but I don’t live near her anymore, so it’s hard. I think this book could give her a lot of motivation! Keep it for myself. I’ve been selling my decorating items to friends for awhile now, and finally finished all the paper work to open a business to do it as my actual job, but worry my town is too small to support it. I’m going to start an Etsy shop in Jan to widen the customer pool. This would be great for my daughter. She is just getting started and has a small Etsy shop. I’m sure she could use the tips. Would keep for myself…until someone I know needs it, then I’ll pay it forward! Thanks for the amazing gift!! I’d keep it for myself! I’m starting to get in to crafting & would love to work my way up to an Etsy shop, but there’s so much to know that it’s overwhelming. This would really help! I would keep it for myself, but probably share you wisdom with one of my best friends that has a shop. I tried running a shop, but I just felt overwhelmed by not knowing what to do and not having very many hits. I would love your book to gain some guidance on the best way to run a shop! I would definitely keep it. I love this blog. Are you kidding! I’m totally being selfish on this one LOL. I’ve had an Etsy before but have recently decided to revamp it and give it a go again in January with necessary changes I’ve learned from you. Gotta do it..Also, I’m super duper proud of you chickadee. I’d totally keep a copy for myself. I love all things Etsy, and while I had my shop open on and off over the last year, I finally decided to commit to making it successful in 2013. Your comment about having 100 listings is my end-of-January goal–push to get to 50 by New Years Eve and another 50 by January 31. I would keep it for myself. I’m trying to open my own etsy shop! I would keep the book for myself. My etsy shop is small with steady sales, which is just the way I need it right now as I am also always booked with custom orders, and provide stock for retail stores, BUT am above all a stay at home mom. I have some fun ideas for the new year though, and could use your advice! Thank Gina! All the best with your book! I would keep the copy for myself. I’ve been thinking about having an Etsy shop for awhile, but I have no idea where to start. I would have to keep if for myself. I have long wanted to step out in faith and begin to try to turn my creativity into a second income for my home. The only thing holding me back is a lack of knowledge, and thus confidence. I want to put my best foot forward in anything I undertake, and it seems your book would be an amazing tool to assist in making my dream come into reality. Thanks for the generous giveaway! How exciting! I would selfishly keep the book for myself. Congrats! I would definitely keep to help me get started..it would become the SOP manual!! Congratulations on the completion of your book! How exciting…:) If I win, I will definitely keep it for myself as I have been toying with the idea of opening an ETSY shop for quite some time. Thanks for the giveaway! I would definitely keep it….then pass it along once it has helped me! I’ve been wanting to start an Etsy shop forever! But just didn’t know where to start etc. I never imagined that a book would be available to answer my questions and guide me. Thank you for making this available! I would keep the book for myself as I am thinking of opening an Etsy shop! Not to sound Scrooge-y, but I’d keep the book for myself! I’ve been in a rut to open up a handmade store, but the motivation and knowledge would be a great boost! I would read it and relish learning all the ends and outs of selling on Etsy. I am an educator and have not been schooled in business or marketing, etc. I love to make items for my classroom, my children (now grown) and for my grandchildren. Many time my girls will say “mom, you need an Etsy shop…my friends would so buy one of these.” So learning how to find my niche audience and the technology to promote and sell, would be so wonderful! Maybe one day I will have a website and an Etsy Shop. Are you coming to Pigeon Forge, TN for an Etsy conference? My husband told me about it. I plan to attend and with the info in your book, maybe I’ll ask the right questions in workshops. Lol. Thanks for offering this giveaway, Gina! Congrats on writing the book too! Oops…that’s “ins and outs!” Sorry. I would give this to my mother-in-law! I’m helping her start an etsy business and I think this could really help us both figure out what we’re doing! Not to sound selfish but I would keep the book for myself. I really need to work on my SEO and photographing my glass is another issue. My Etsy shop has been opened for over two years and my sales seem to be stagnant. My jewelry pieces are one of a kind small pieces of art. I also create home decor studio pieces. I’m so excited to get my hands on a copy of this book! Thanks in advance! If I was to win a copy, I’d read it and pass it along to one of my Etsy Maine Team members! I opened my shop in April and I couldn’t be more optimistic! Slow and steady wins the race and I can’t wait to see what the New Year holds! Definitely for myself. I took the first step by leasing a space in the local antique mall but now want to reach out and offer online purchases along with shipping. I would definitely keep it for myself. Thank you for sharing and the chance to win! First of all….CONGRATS! I have always wanted to start selling on Etsy but never knew how to be successful at it… I would totally keep this for myself…and probably buy more for my fellow crafters. I need a way to earn extra money without leaving my children, working nights and weekends outside of my house. I would keep the book. I am in the process of learning enough to set up a shop, so I would keep the book for myself, read and take notes, then send it one to my daughter-in-law. Hi…great article! I would keep the book for myself at first then share it with someone when I finished reading it and learning EVERYTHING! I have 4 etsy shops….I want this to be my job. I agree that it takes hard work and I don’t mind that. I need to learn more about SEO and paying my self. I have noticed now that my injoytreasures shop has 100+ items my sales have increases….got to get busy making more stuff. Look forward to reading your blog in the future! Congratulations on the book!! I would keep it for myself then share it with some friends that have an Etsy shop.. My daughter and I have a shop and have wanted to grow it. This book would be so helpful! For me, and well, for someone else too! I would love to read this and also pass it along to my mom and sister! My mom is planning on starting an etsy store next year so I’d give this book to her. I would def keep it for me. Thanks for the chance to win it. Cheers and merry Christmas . I SO need this book. I have been wanting to start and ETSY shop, but now I really NEED to. We need the money so that I can stay-at-home with my kids to homeschool them. Having this book would be really helpful. I would definitely keep it for MYSELF!! I do a multitude of things to sell in various places, but want to narrow it down to just one. But, then how would I promote it on Etsy? I need that book!!!! I would keep the book for myself. I do not have an etsy shop yet, but I am seriously considering some occupational changes this year. Thanks for sharing! I would love to read your book to help me polish up my store. I just started my Etsy store in November. I have a few orders for Christmas and I’m so excited about that. I’d love more help for 2014 and beyond. I’m a stay at home mom who loves to create. I’d love to read your book and keep it. Glean some knowledge and make my new Etsy store take off. I’m excited about the projects I have dancing in my head for 2014. Thanks. About starting an Etsy business.. I would keep it for myself…I have a small home-based embroidery business that I’m looking to grow and this is exactly what I need!! I would keep it for myself…I have been selling on Facebook and have recently purchased a building in our downtown area. I have never used Esty so this would be another great market place. does a kick in the rear to get started come with the book? I would give it to my mom who struggles with believing in herself. She could do it I know! I’ve been thinking about opening an Etsy shop but really have no idea how to do it. This book would be a Godsend. Thanks for entering me in the contest. I want the ebook for myself since I’m trying to get started. BTW I loved the 10 sewing projects! Love sewing. I would keep the book, but I work in a shop where there are over 60 vendors, many are artists, who I would share this information with! I would keep the book for me. For years I have wanted to open and Etsy shop just never confident enough with the ends and outs to take the plunge. I have a storage unit full of handmade jewelry just waiting. Congratulations on striking out on your own and finding success! You are quite inspirational and I look forward to reading your book. Thank you for sharing your experience. I most certainly will read your book, but then I’ll pass it on to a good friend who is much closer to making his Etsy dream a reality than I am. I know he will share his experience with me when the time comes. All the best. I’d love a copy! I’d totally keep it for myself! I would so keep it for myself! I have been making home-made all-natural products and eventually want to sell in Etsey. What a great way to get familiar with it. Thank you for the opportunity to have a chance to win! And congrats on the book! If I am fortunate to win I’ll keep the winning copy for myself and buy another for a friend. If I receive an autographed copy, I’ll buy a book for two friends. I will post this opportunity for all friends on my Facebook! Thanks! I would be sharing this book with my 2 daughters. We are planning on starting an Esty business. This would be an awesome addition to our education. Totally keeping it…I could use all of the advice I can get! I would love to win your book for myself. I am trying to transition from hobby to business for a year and admit I need help. Congrats on writing your book. Thanks for the information! I love being a part of your blog, I feel like I get special tips and ideas (and much more) that nobody else gets! I would keep your book so I can grow….errr start, my Etsy business….I’m proud of my hand-made wedding decor so I’m not sure why I haven’t posted the pictures I took (at least) 6 months ago, I guess I’m scared of failure! Would like to begin to transition away from my full time job. What an opportunity – I have been looking at becoming an Etsy-er to sell my wares, but the prospect has been daunting as it is hard to know where to start. In other words, I don’t have a clue! Your book could change my life (and it sure needs it), giving me the knowledge to truly do it right, right from the start. I would keep it, keep it by my side for every action and then, when I have it down, let it fly away to another’s needy hands to help them on their way too. Thank you so for offering this! oooh ! I wish I won it ! and if I do, I will keep it for myself and study it so that I dare opening my shop !!! Will keep for myself for awhile then plan on sharing! My daughter & I have a small business in an antique mall & would like to turn it into an online store only. We love the boho/gypsy styles & are in the process of making our own jewerly! We also sell women’s & children’s clothes & accessories! Thank you for being an inspiration to so many!! This book is KEEPER for me! I’m retiring in 12 months and will have the time to devote starting my blog and etsy shop then. This book would help me SO much. Would LOVE to read your book – and apply what I learn. Planning to open a shop 1st quarter next year – would love some help with the business and practical issues involved…. Thanks so much for the time and effort you have put into this! I have been following your blog for a few years and would absolutely love a free copy of your book! I have had my Etsy store https://www.etsy.com/shop/RefurbishedwithLove for about two years and it is in need of attention! A big goal of mine for 2014 is to pump up the business in my store and on my blog. These are just not strong points for me and I believe your book would be the great lesson for getting me started. I have spent the last two years growing my business locally and now need to focus on growing virtually. Not to mention I had to google SEO! I need your book! Thank you so much for writing this book! I would so happy to have my own copy. I’ve had an etsy shop since 2006 which was very part time until one year ago when I quit my day job. I’ve managed to make significant changes to my shop but still feel I need a boost. I would definitely keep this book for myself! The timing is perfect – I’ve been struggling with the decision of whether or not to open an Etsy shop. The only thing holding me back is how overwhelmed I am by all of the info out there on pricing, packaging, branding, etc. To have all of the answers in one place would be fabulous! Wow, I just happened upon your site from your cheddar soup recipe on google+! I am a 46 year old mom, wife and displaced worker looking for something to fulfill my days and my wallet. Etsy is new to me so I would be keeping the book to learn all that I could. This bird may be getting old but she can still learn some new tricks! I would definitely keep the book for myself, to help improve my shop! Congrats on the book! I would keep it for myself. I have been thinking about opening an Etsy shop for a while now. But just don’t know where to start. Winning your book would help. Thanks. Congrats on the book, Gina! I’d love to have a copy for myself. I’m sure I would learn a lot. I am so excited about your book, it looks great. I would definitely keep it for myself. Hope to win but I will read it either way. I think both my friend and I could benefit from this. We’ll consider this a joint gift! I would absolutely love to have a copy of this book! I’m 24, and my mom and I have been dreaming about taking the plunge and starting our own business for a long time. I would read it, hen pass it on to my daughter. She does amazing crochet, and could use the tricks to set up a shop. We would keep this for ourselves! We are always looking for ways to improve our online Etsy presence and look forward to reading your book. We were bummed we missed you at Blackberry House. Congratulations! I would definitely keep the book for myself. I have wanted to start an Etsy shop for some time now, I eve have quit a bit of inventory I could start with, but I just don’t know where/how to start. Thanks so much for the chance to win! I would keep it! Thanks for the opportunity! It would be a great present as December 20th is my birthday! I just found your blog! It’s fantastic and almost everything I’ve been looking to find out is on here. I know your book would be much more detailed and I can’t wait to read it. I would most definitely keep it myself and use it for the opening process of my store which is due to open January 1, 2014! I’ve been working around the clock to get everything ready. I believe your book will help me finesse things along the way and help my store take off! I’d keep it, because I need the income, and I don’t know how to start a business. I would keep the book, and then pass it on to help someone else! I would keep it for myself. Would love to learn a few tips! Thanks for the opportunity. Happy Holidays! Love it! Mine came in the mail yesterday and I started reading right away!! Hi Gina! I just finished reading your book and I loved it — such a wealth of information! Thank you for writing this and for sharing your knowledge.